What's a DVD collection without one, two, or eight films that are regarded as 'sin' but you couldn't help forking out for at the checkout? Ghost Rider for me, is one of those films. The only thing that doesn't make me spew hellfire about the whole thing, is the special effects used to bring one of Marvel's best concepts to life - but still there it's DVD sits; third row, second rung down. 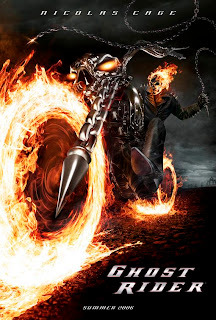 Luckily (as there's only a set amount of hellfire one can spew in a life) more news has come from Collider, that hints not only will the second upcoming "hard PG13" Ghost Rider film, put the Rider back on track, it may also contain absolution for the sins of it's past. Producer Mike De Luca says production could start in 2010 and that "...it is pushing the reset button, and I think putting the character in kind of an appropriate darker context." If that "darker context" rules out the other two of the six deadly sins, namely 'jelly beans' and 'Karen Carpenter' then Ghost Rider fans just may have found that their prayers have been answered.